Depending on laser wavelength and tissue characteristics, laser irradiation can be absorbed, scattered, reflected or transmitted into dental tissues (Ana et al., 2006; Featherstone, 2000; Niemz, 2004; Seka et al., 1996). These effects must be well known by professionals to help them choose the best equipment for a specific clinical application and to avoid thermal and mechanical damages to the target and surrounding tissues. Depending on the clinical situation, dentists need different laser wavelengths and irradiation parameters to obtain distinct effects on the same tissue. Considering the applications in restorative dentistry, the conventional high-intensity infrared lasers can be well-suited for caries removal (Neves et al., 2010; Tachibana et al., 2008; White et al., 1993), cavity preparation (De Moor & Delme, 2010; Moldes et al., 2009; Obeidi et al., 2009;) and tissue conditioning (Botta et al., 2009; Dundar & Gunzel, 2011). For that, continuous emission lasers or pulsed laser longer than 1 picosecond should be well absorbed by the main components of teeth, i.e., water and hydroxyapatite; to promote the desired thermal and mechanical effects on these tissues, in a process called thermal ablation due to a thermomechanical effect (Fried, 2000; Niemz, 1995; Seka et al., 1996). For shorter pulses, such as femtosecond laser pulses, the ablation occurs due to non-linear interactions with the tissue resulting in a plasma-mediated ablation. 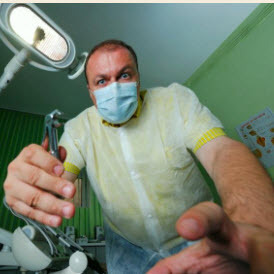 The thermal ablation process that occurs in dental hard tissues is also known as explosive (water-mediated) tissue removal (Fried, 2000; Niemz, 1995; Seka et al., 1996). In a few words, this process can be explained as a result of the fast heating of the subsurface water confined by the hard tissue matrix, due to the higher interaction with infrared laser irradiation. The heating of these water molecules leads to an increase on molecular vibration and, consequently, an increase on subsurface pressures that can exceed the strength of the above tissue. Finally, it can be noted an "explosion" of tissue due to the material failure, resulting in the material removal. This process happens in temperatures below the melting point of dental hard tissues (around 1200oC) and varies according to the laser wavelength (e.g., Er:YAG reaches 300o C at the ablation threshold, while Er,Cr:YSGG reaches 800o C and CO2 9.6 ^m reaches 1000° C) ((Seka et al., 1996; Fried et al., 1996). This process has been studied for the past 30 years, with the intention of choosing the best laser wavelength and parameter to effectively promote tissue removal or selective caries removal with minimal thermal consequences (Stern & Sognnaes, 1964; White et al., 1993; Neves et al., 2010; Ana et al., 2007; Seka et al., 1996; Tachibana et al., 2008; Moldes et al., 2009; Botta et al., 2009; Dundar & Gunzel, 2011). For understanding how laser irradiation can provide a more conservative treatment of caries lesions, the chemical composition of target tissue must be known by the professional. Human enamel is composed by 95% hydroxyapatite (Ca10(PO4)6(OH2)), 4% water and 1% collagen fibers (Gwinnett, 1992); as well as human dentine contains 70% hydroxyapatite, 20% collagen fibers and 10% water (Ziip & Bosch, 1993). Considering the differences in composition and the higher resonance of Er:YAG (X = 2.94 ^m) by water (X = 3 ^m), we can infer that Er:YAG laser can ablate dentin faster than enamel. The same rule is valid when comparing carious tissue with sound ones, taking into account that decayed tissues have a significant higher amount of water. In this way, in a clinical application, professionals can observe easier caries removal when compared to the removal of sound surrounding tissues, and this fact can influence the laser irradiation parameters that should be used for different application. Dental enamel and dentin have a weak absorption in the visible (400-700 nm) and near-infrared (1064 nm) wavelength ranges; however, absorption bands of water and carbonated hydroxyapatite is found from 2.7 to 11 ^m (Figure 1) (Ana et al., 2006; Fried 2000). The optical penetration of Nd:YAG on enamel is significantly high, indicating that the dentin irradiation with Nd:YAG laser can affect the pulp tissue in case of high energy densities, long exposure or in the absence of a photoabsorber (Boari et al., 2009). However, Nd:YAG laser can be indicated for removal of stained caries tissue, promoting a selective removal of caries lesion without pulpal damages due to the higher interaction of Nd:YAG by pigments (Seka et al., 1996), as it was demonstrated by a clinical trial performed by White et al. (1993). Considering the use of Er,Cr:YSGG laser, literature evidences (Stock et al., 1997) that the 2.78 ^m is strongly absorbed by the dental hard tissue since the optical absorption coefficient of enamel is about 7000 cm-1. In this way, the optical penetration is a few micrometers smaller than the obtained by Er:YAG laser. Fig. 1. 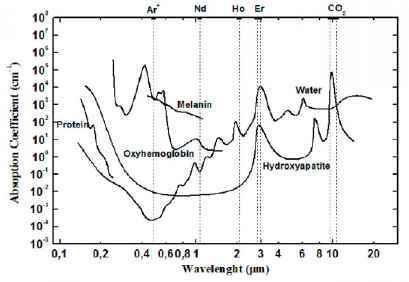 Absorption coefficients for the main chromophores of biological tissues (Ana et al., 2006). Since the approval of erbium lasers for dental hard tissues use by FDA in 90's, Er:YAG and Er,Cr:YSGG have been extensively studied for caries therapy. The literature present a number of advantages over the high-speed drills for the removal of caries, such as reduction of pain, noise, vibration (Fried, 2000; Niemz, 2004; Seka et al., 1996; White et al., 1993), the possibility of selective removal (Eberhard et al., 2005; Neves et al., 2010) and the changes in chemical composition of remaining tissue (Ana et al., 2006; Bachmann et al., 2009; Botta et al., 2011), leading to a tissue that is resistant to demineralization. That is why erbium lasers can be considered a clinical reality in dental offices.